I splurged a whole fifteen dollars recently and treated myself to (yet) another cookbook. I had first heard about Megan Gordon when I stumbled across Marge Granola, and soon after discovered her blog. She mentioned a soon to be released cookbook, but at the time, I resisted. Her book came out over Christmas, and shortly after, its all I was seeing online - Sprouted Kitchen, A Couple Cooks, The Fauxmartha, The First Mess - they each tackled Megan's recipes with their own charm and raved about the book. I had to get it. Whole Grain Mornings is a slew of creative and unique breakfast recipes organized seasonally. As you may realize from the ever expanding granola section, I have been on a total home-made granola kick for the past few months, but this book made me want to hop over to Bulk Barn, stock up on ever grain and seed and try every one of Megan's recipes. I settled on Morning Glory Oats as my first; this warm bowl of goodness was delicious and perfectly satisfying on these oh so chilly polar vortex mornings. *Note: I'm not the biggest fan of orange zest, so though I used it this time around, I think I'd skip it next time. 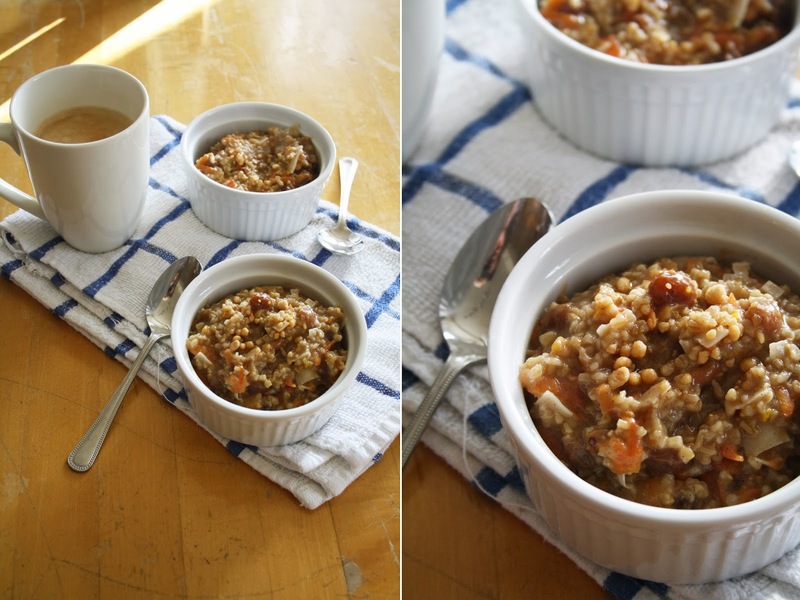 In a large bowl, combine the oats, grated carrots, raisin, spices brown sugar, vanilla and salt. Bring the water and milk to a gentle boil in a saucepan. Stir in the oat mixture and return to a boil. Once boiling, reduce the heat to low, tilt the lid to partially cover the pot, and cook, without stirring, for 25-30 minutes, to yield a soft yet chewy consistency. Remove from the heat, stir in the coconut and zest and let sit, covered, for 5 minutes. Serve warm with a sprinkle of maple sugar flakes.